Nerd Tip: Fixing your OWC Aura external drive icon | Rewatchable, Inc. 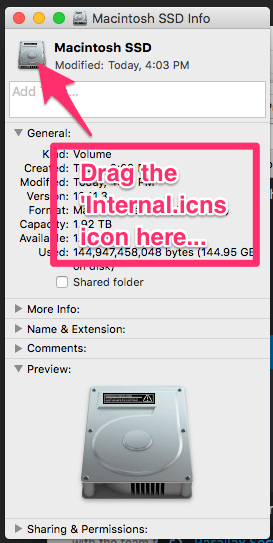 Drag the ‘Internal.icns’ icon from the Finder window you opened to the icon in the top left hand corner of the ‘Get Info’ window you just opened. Boom! You’re done. Close ‘Get Info’ and Finder, and you’re back in business. now how about it not showing on the desktop as an external drive? Unfortunately, as far as the Mac Pro is concerned it *is* an External Drive. But that doesn’t impact the speed, etc. The icon was just incredibly annoying to me, and I worried that any freelancers using that system could mistakenly treat it as one, so I was glad to be able to change it to the ‘internal icon’.